What could be more delightful than sipping on complimentary wine and munching on cheese and crackers in an elegant gallery? Well, how about pairing that pairing with a succinct and stimulating panel conversation about the future of books? 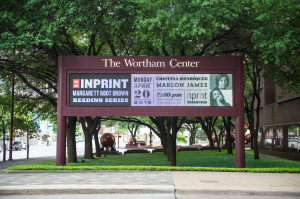 On Thursday, April 16, about 45 Houstonians gathered at The Printing Museum to attend the most recent installment of Ligatures, presented by Gulf Coast. The series is aptly named—a ligature is a typographical element that combines two letters. Generally, it is redolent of threads that bind. This event brought together four notable artists, critics, and creative writers to discuss the craft, historical artifact, and future of artist books. Raphael Rubinstein, professor of critical studies at the University of Houston School of Art, moderated the panel, which consisted of artists Suzanne Bloom and Chitra Ganesh, and poet Roberto Tejada. Each, in fact, have multi-hyphenated practices—muralist, graphic novelist, anthologist, educator, etc. 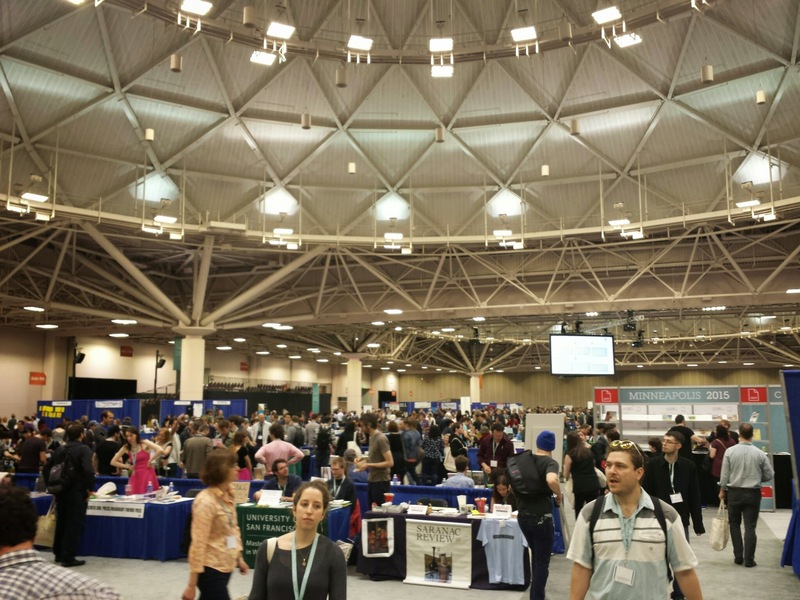 If you have any writerly friends or circulate in literary circles, you probably couldn’t help but notice all the #AWP15 hashtags and selfies last week on Facebook, Twitter, and Instagram. Every year at this time the Inprint staff notices a mass exodus of writers leaving Houston for a few days to go to this thing called AWP. Last week it was Minneapolis, next year it will be Los Angeles. One wonders what AWP really is. 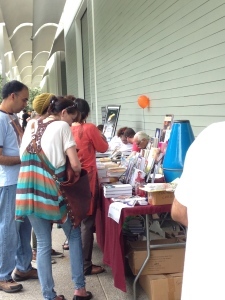 What happens when so many writers congregate in a square mile? Is it an academically inspired conference where writers exchange thoughtful and innovative ideas, or is it just one big party? We asked Sam Dinger, Inprint C. Glenn Cambor/Michael and Nina Zilkha Fellow, Inprint Poetry Busker, and MFA fiction student at the UH Creative Writing Program, to be our eyes and ears at AWP. 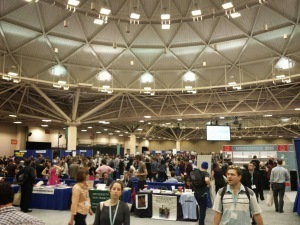 This was Sam’s first time at AWP and here is how he breaks it down for us. Inprint: What exactly is AWP? Who attends? April marks National Poetry Month. As we kick off this month, we thought it would be nice to showcase one of Inprint’s favorite programs, the Inprint Poetry Buskers. These poets spread the joy of poetry by writing poems on demand, using typewriters, at festivals and special events throughout the city. The Inprint Poetry Buskers can often be found at Sunday Streets. This past Sunday, they were writing poems on demand at Sunday Streets on Westheimer. Here, Inprint blogger and poetry busker Allyn West talks about poetry busking at Sunday Streets. Sunday Streets is a hard thing to explain. The City of Houston, through its partnership with Cigna, talks about the initiative as a way to promote health and fitness. Those of us who have been to one, though, know that it’s much more than that. 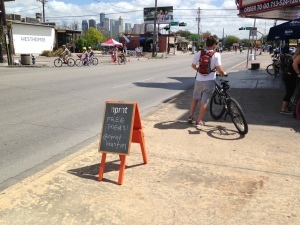 Sure, you’ll see people riding their bikes or jogging or doing parkour in the middle of the street, but you’ll also see organic farmers hawking fresh turnip greens and aspiring rappers peddling demo CDs.